Zoho Mail provides a wide set of choices to add attachments to your email. The maximum size of the attachment is based on the subscription plan for organization users. For personal users, the maximum email size including all attachments is 20MB. However, in case of organization users, the administrators can add further restrictions to the email size using Mail Policy. Generally, when you add attachments to your emails, the files get MIME encoded as per the RFC standards, to make it readable by the recipients, irrespective of the providers. Open the editor to draft the email. Select the attachments from your desktop. Drag them into the Composer window. A drop area with the text 'Drop files here' will appear. Drop the dragged files inside the box. The files will be added as attachments to the email. *The Attachment Drag and drop feature and attach multiple files features are supported in the Firefox 3.6 and above, Chrome 6.0 and above only. Using the drag and drop option, the attachment(s) of the emails in your mailbox can be attached to a new email you are composing. From the email preview of the relevant email, select the attachment(s) you want to attach to the new email. Drag them into the Compose tab. Drop them onto the drop area with the text Drop files here. The dropped attachments will be added as attachments to the new email. You can also do the same for attachments in Streams posts, Notes and Tasks by following the same steps. You can attach emails in your Mailbox as EML files to outgoing emails using the Drag and Drop option. Once you have Compose open inline or as a new tab, you can drag the desired mail and drop it onto the Compose area to automatically attach the mail as an EML file. You can attach emails while composing replies inline or in a new tab, by following the same steps. Multiple emails can be attached at once by selecting them using the check-box and dragging and dropping them. Alternatively, you can use the "Forward Multiple email" option to attach emails as EML files while composing a new email. Click the check boxes next to the emails that need to be attached. Select the "Forward multiple email" option from More Options. The selected emails will get added as attachments in a new compose tab. The attachment icon allows you to attach files from the desktop to your email. You can also attach the emails from Zoho Docs or other cloud storage services by choosing the provider and the file respectively. 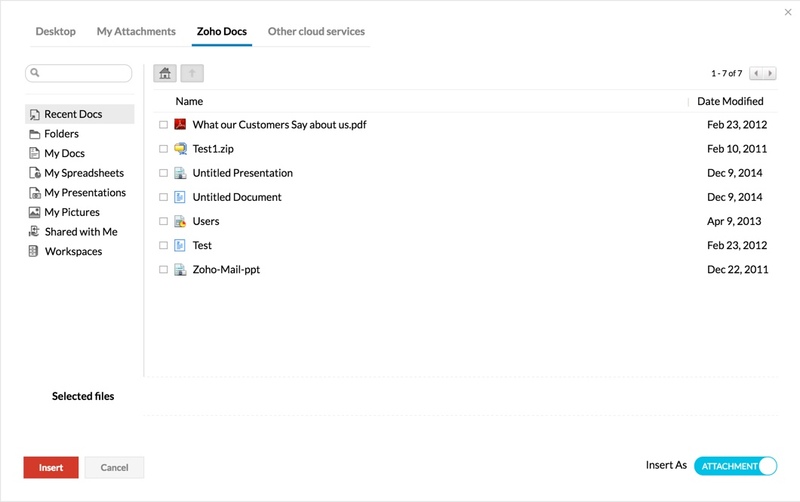 Zoho Mail being a cloud email supports other cloud storage services like Zoho Docs, DropBox, Google Drive, One Drive, Box, and Evernote. 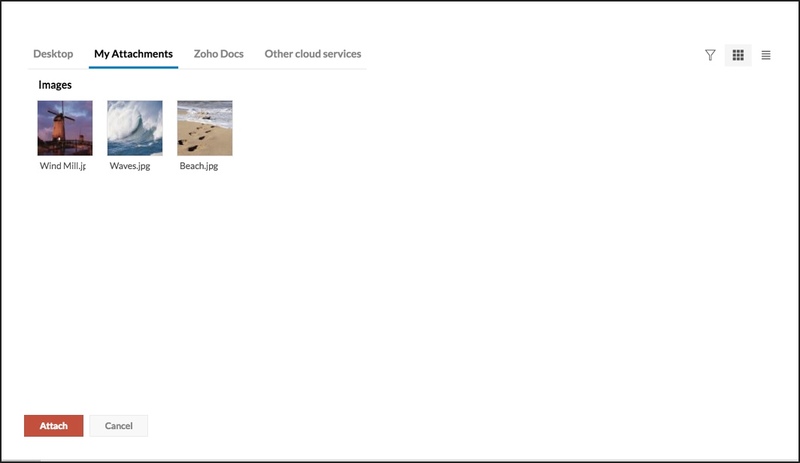 Click the 'Attachment' icon to choose a file from the desktop or other cloud services. The 'Desktop' tab of the attachment window opens your system file browser. Select the required files and click Open to add the files to the attachments. You can also drag and drop the required files onto the attachment window from the file browser. You can choose multiple files using Ctrl/ Shift keys and based on your browser support. Click 'Attach' to add the selected files as an attachment to the email. Zoho Mail allows you to browse the existing attachments using the 'My Attachments' section. You can locate the exact attachment using the Filters option in the right top corner. 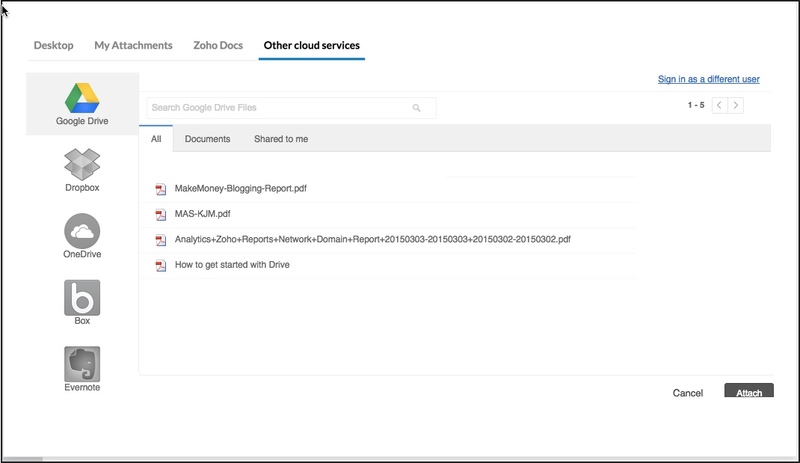 Zoho Docs is a part of the Zoho suite of applications and stores your files in the cloud. 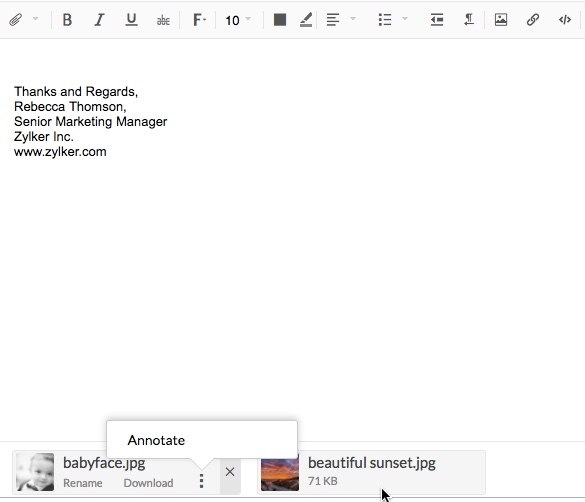 You can insert the attachments stored in your Zoho Docs account directly while composing your email. 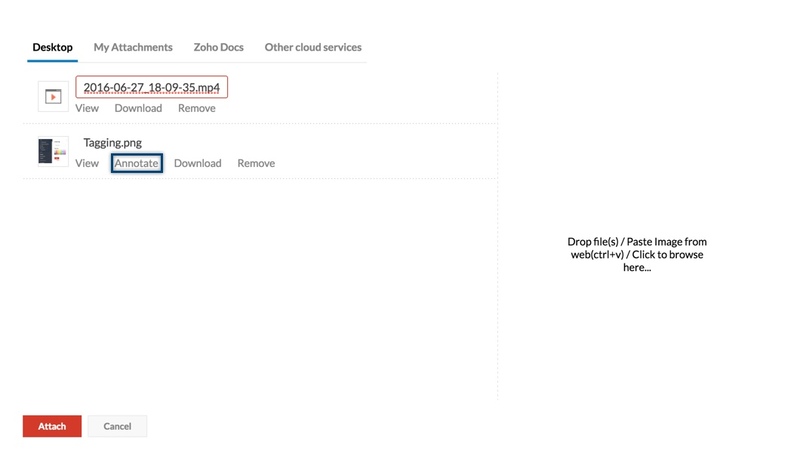 Click on the 'Zoho Docs' tab in the Attach from Cloud window. The files are classified as documents, presentations, spreadsheets and so on. 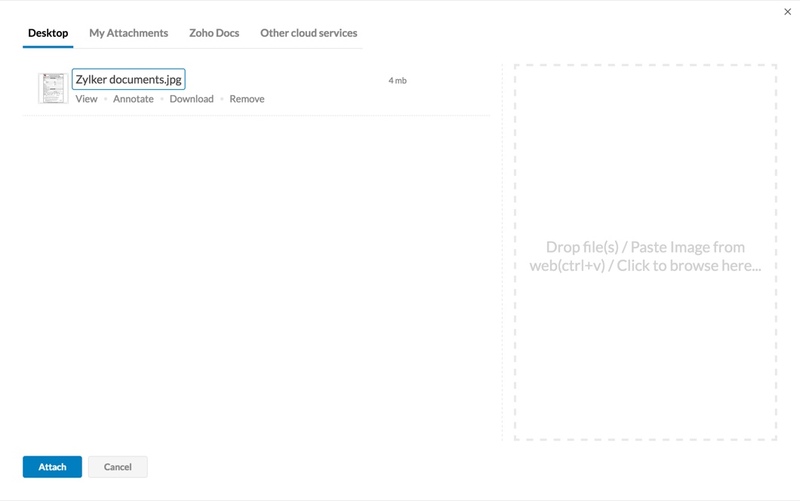 You can also attach the files, that are shared with you via Zoho Docs. Select the files you want to attach to the email and click Attach. The selected files will be added as attachments to your email. If the combined size of the attachments exceeds the allowed limit, you will get an error message. 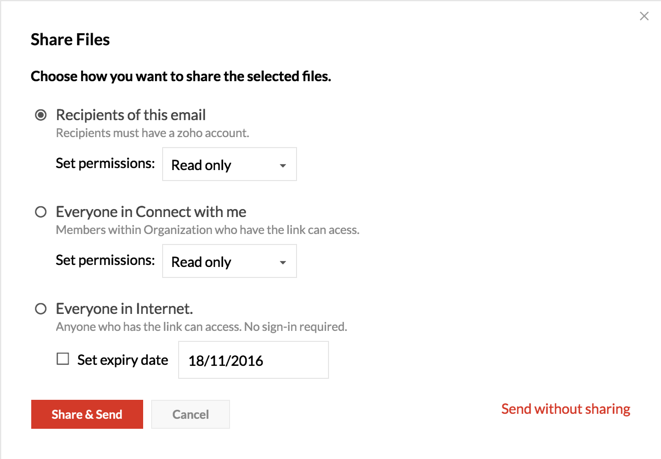 Instead of inserting the entire attachment, you can choose to insert just the link to the attachment and set the share permissions as required. Click on the 'Zoho Docs' tab. In the bottom right corner of the window, set the option in the 'Insert As' toggle bar to 'Docs Link'. Select the files whose links you would like to send. After selecting the required files, click 'Insert'. The links to these files are inserted into your compose window. The 'Share Files' window pops up. In this window, set the share preferences that you want to assign for the document. Recipients of this email - Members who receive your email and have a Zoho account can access the document. You can set either Read only or Read/Write permissions. Everyone in Connect with me - Members within your organization who have the link can access the document. You can set either Read only or Read/Write permissions. Everyone on the internet - Anyone who has access to the link can view the document. In this case, the recipient can't edit the document. In case you want the document to be available only for a particular period, select the 'Set Expiry Date' checkbox and set the relevant date. Click on 'Share & Send' to share the attachment link via email. You can only share documents that are owned or co-owned by you as Docs links. You can choose the attachments from Dropbox, Google Drive, One Drive, Box and even EverNote apart from your desktop files and the files in Zoho Docs. When you use for the first time, you need to 'Authenticate' and allow Zoho Mail to browse and attach files from the service you choose. Once successfully authenticated, you can select the files listed in the Cloud Storage. You can select multiple files and click Attach to attach them to your email. Similarly, you can also Save the attachments in your incoming emails, directly to your Cloud Storage accounts. Refer the help page 'Saving / Viewing attachments' for details. After selecting the necessary files, you can Annotate (highlight, add text, add colors, mark) important portions of images. Once you have attached all the attachments will be listed in the bottom of the email you are composing. You can rename the attached files or annotate attached images, even after attaching them. If the mail size exceeds the size defined by the mail policy, an alert will be displayed and the message will not be sent.